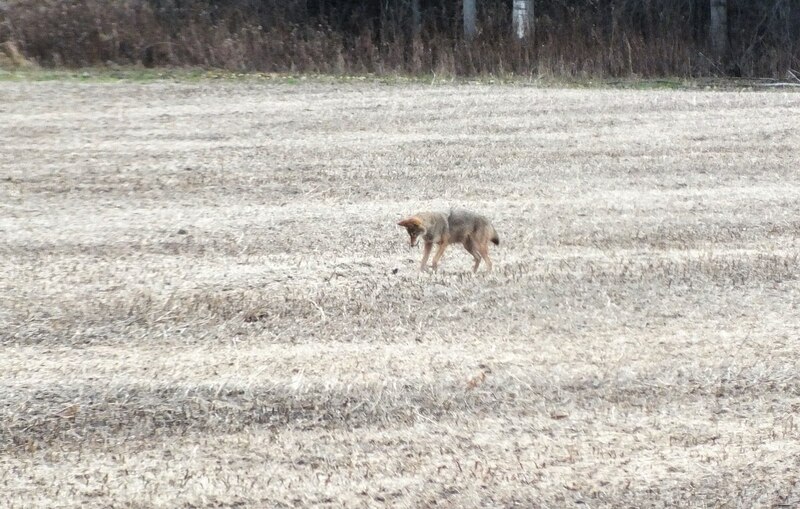 On a drive north of Whitby , Ontario, Bob happened to glance into a farm field adjacent to the highway where he spotted a Coyote (Canis latrans) sauntering along. 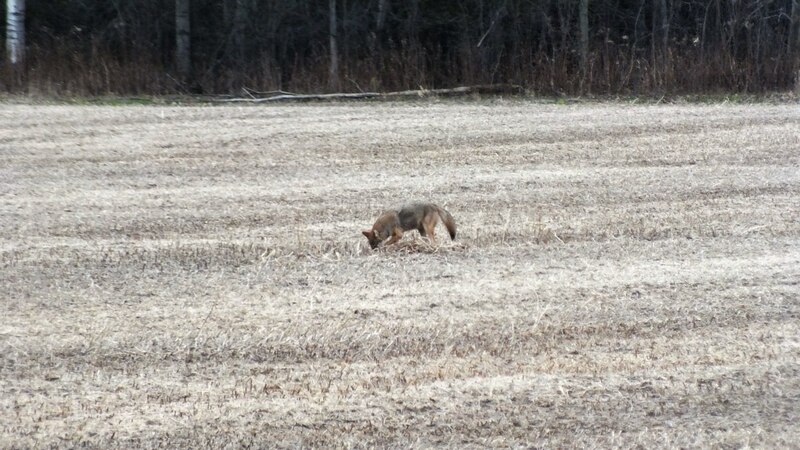 It is quite common to see Coyotes in and around rural farm properties in Ontario, as well as right in the heart of cities like Toronto, where they share our green spaces and waterways. 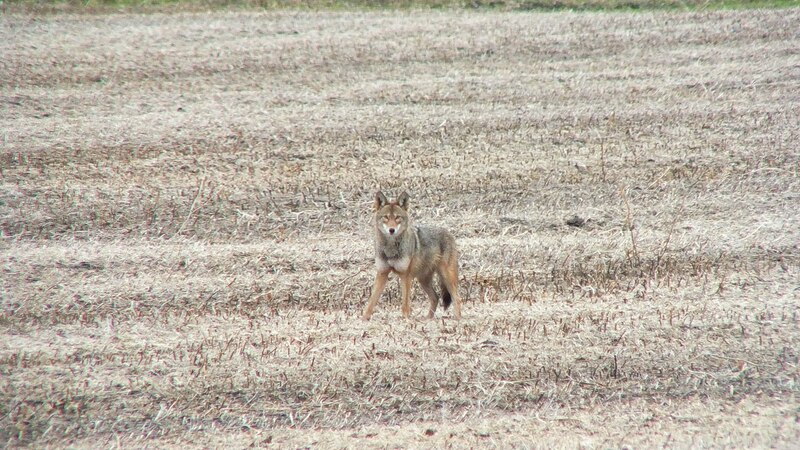 Given the dried remnants of some agricultural crop that transformed the land into a pale brown surface, it is remarkable that Bob saw the Coyote at all. We had been keeping a sharp eye out for Snowy Owls given that so many have been sighted in Central Ontario in recent weeks, but it was a Coyote that had us pulling over onto the shoulder of the road as I reached for my camera on the backseat of the car. At first, the Coyote paused for a look in our direction, but with other vehicles whizzing by, the Coyote lost interest in our automobile seeing as I was shooting from within the car through an open window. 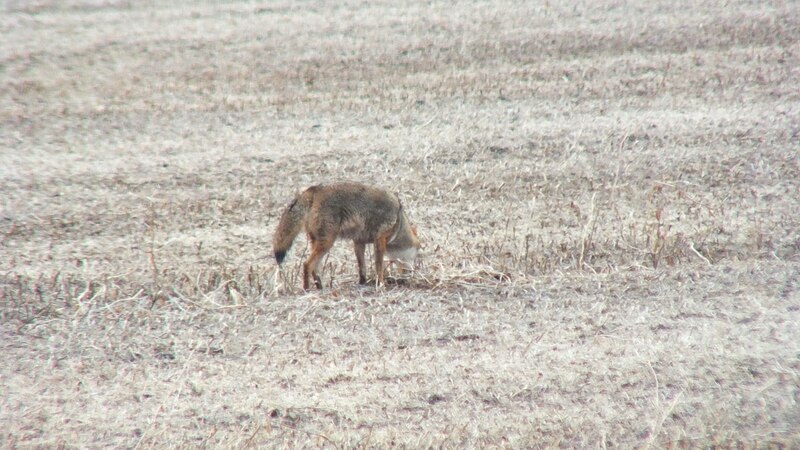 The Coyote instead took a sharp interest in some little critter that was moving about the stubble. Coyotes are opportunistic feeders so whether a mouse, rat or vole, maybe even a toad tempted the Coyote, the creature did not stand much chance there on the open land. Coyotes are formidable hunters with sharp vision and a keen sense of smell, but the Coyote did have to exert some effort to catch it. A couple of times, the Coyote would vigorously dig at the earth and finally seemed to come up with something, but our distance, even with binoculars, made it impossible to ascertain what the prey was. 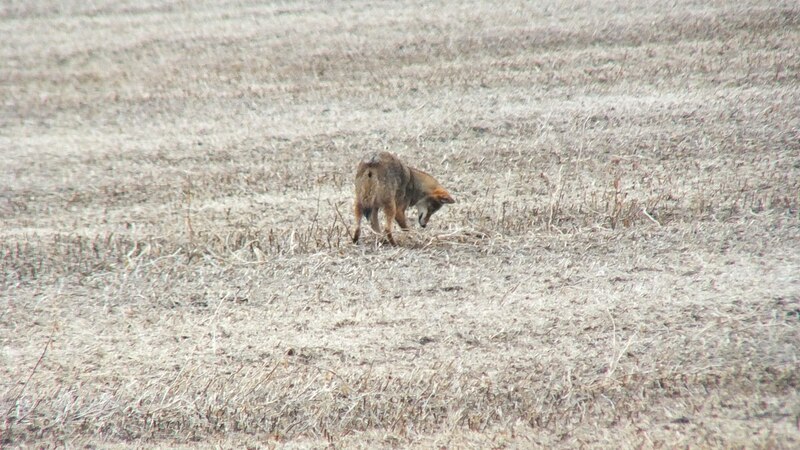 I’m sure the local farmer would thank the Coyote for controlling the rodent population. 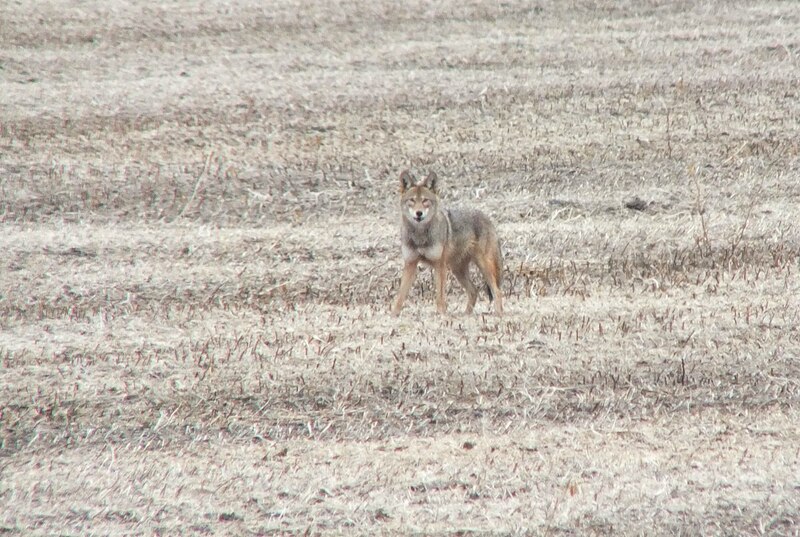 The binoculars did allow Bob and me to appreciate the Coyote’s beautiful coat. The thick fur ranged in colour from greyish-brown to reddish flanks and legs, which had me wondering if, in fact, I was looking at a Coyote or a huge Red Fox. It was the long bushy tail with its black tip and the general stockiness of its body that convinced me otherwise. In fact, a Coyote’s thick fur makes it appear heavier than its actual weight, which for a Male averages between 9-23 kilograms (20-51 lb). 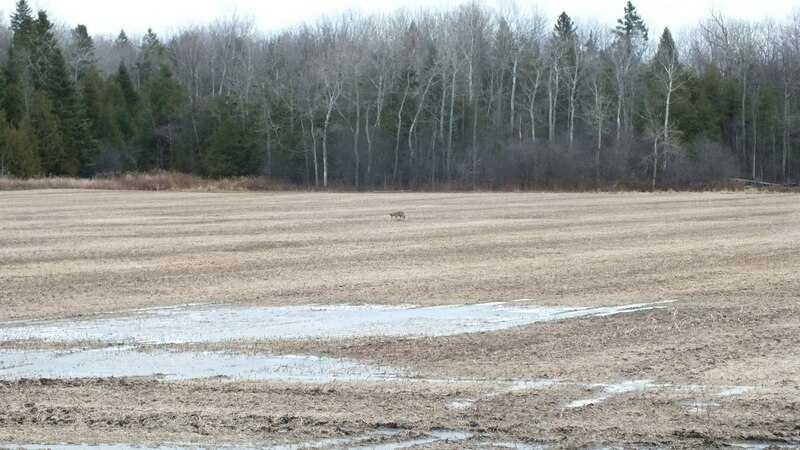 As we looked on, it appeared as though the Coyote tossed its prey and then pounced on it once again. An Eastern Coyote will adjust its hunting techniques according to the size and type of prey, but we did have to wonder if the Coyote was simply toying with its food. Our sojourn at the side of the road lasted a brief ten minutes or so before the Coyote took note of Bob’s activity when he exited the car to retrieve another camera from the trunk. Perhaps feeling vulnerable there in the wide open space of the field, the Coyote trotted off towards the southern perimeter where it disappeared into underbrush. We continued on our merry way.